Making rugs to me is about transformation – from wool and linen to something new which carries my own creative spirit in its pieces. I use the elements of design, color and texture. The repetition of making rugs is for me close to meditation, and the energy I get from watching the rug grow – watching my design change as I choose each strand of wool – is related to my childhood sense of play. I design and make hand-hooked rugs, and traditional English proddy rugs. 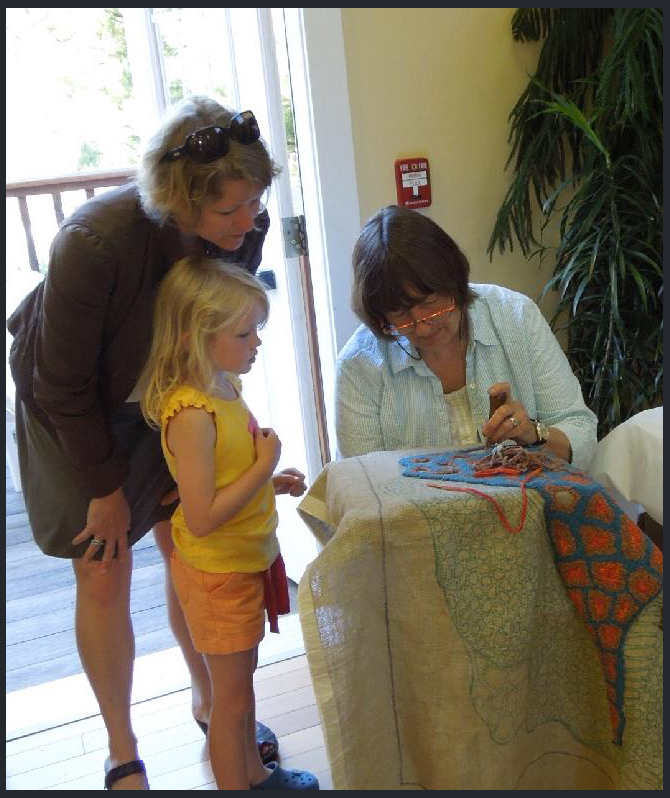 I am a juried member of the League of New Hampshire Craftsmen, and a winner of the “Best In Fiber” Award at the League’s annual “Living With Crafts” exhibit. I have also had rugs in exhibits at the Shelburne (VT) Museum, Gallery 205 in Concord, NH, The Schwenkfelder Museum (PA), The New London (NH) Historical Society, the League of NH Craftsmen’s gallery in Concord (NH), the Lyceum Gallery in Manchester (NH) and in several exhibits in England. My rugs have been featured in several books on design and rug hooking, and in Rug Hooking Magazine. I hope you enjoy looking through the gallery of rugs, and also the rugs (and hand-carved proddy tools) in the “For Sale” section. And in the blog you will find a day-by-day collection of what interests or inspires me. I think writing the blog helps me look at things around me more carefully. P.S. Touch or click on images to see them larger.